A new dog park is set to be opened in the heart of peninsular Halifax sometime in the near future, but it won’t be a park for any Spot, Fido, or Trixie to enjoy. This park is for the exclusive use of pups with jobs, and the people who rely on their service. Halifax has been home to a service dog park for a number of years now, located at the corner of Cogswell Street and Rainnie Drive. But with the new roundabout being constructed, that needs to change. Mosher’s staff was tasked with finding the new spot, with a number of criteria recommended by the city’s Accessibility Advisory Committee. You might be wondering why service dogs couldn’t just use any old dog park the city has to offer. Well, owning a service dog comes with a lot more concerns and considerations than just having a pet dog does, and that extends to their playtime. Stephanie Berry is a local athlete who has retinitis pigmentosa, a degenerative eye disease. 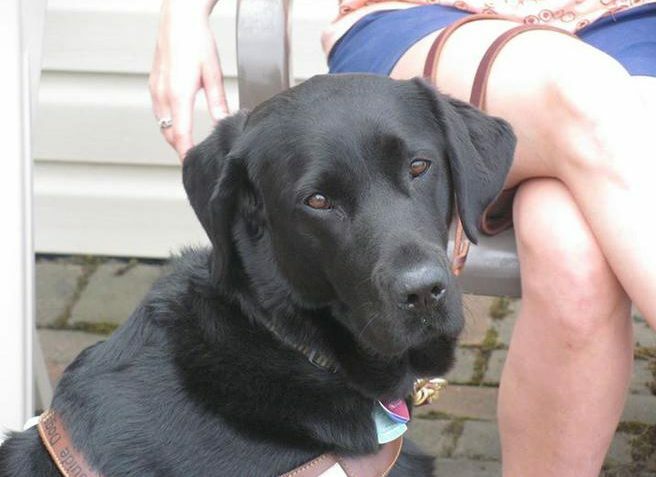 Berry also has a black Labrador retriever guide dog named Jacuzzi, who she has had for three years now. It’s Jacuzzi’s job to guide Berry around obstacles and lead her to and from places, but Jacuzzi’s a dog just like any other, and needs to be able to do regular dog things as well. However, because she’s a working dog, she has special training requirements that could be jeopardized by going to a regular dog park. She could get into treats or toys that she’s not allowed to get into, and she could even be hurt by other dogs. Not to mention, there’s the safety of the owner to consider as well. Council recently approved of Ardmore Park as the location of the new service dog park, and work has already gotten underway. A new fence will be put in, the land regraded, and the city is working on developing a swipe card system so that only eligible users will have access. But that doesn’t mean this park won’t benefit the community as a whole as well. While they build the new service dog park, the city has opened their ears to residents and will address some more universal maintenance concerns they have at the same time. For users like Berry, though, the biggest boon the new service dog park will provide is just the peace of mind knowing that it will be a space for service dogs and their owners alone.